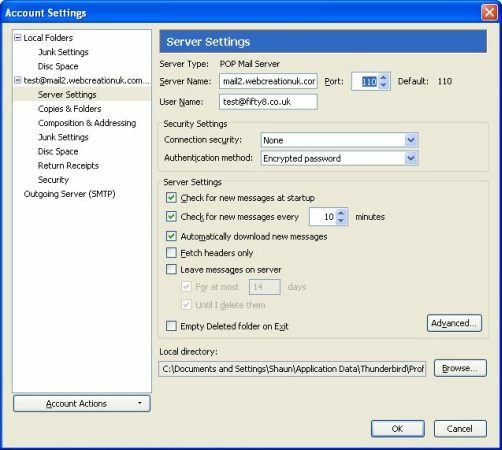 In order to allow you to get the best from these accounts we suggest you set them up to Outlook or Entourage. However, you can also access them online using a browser. The link for this is below the step by step guide I have provided to assist you on setting your accounts up. Thunderbird will then search for the correct information for the server. This will fail. 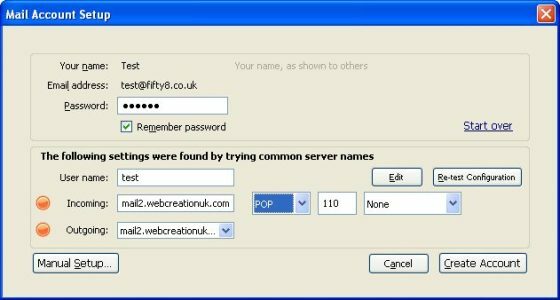 You can access your accounts remotely via http://mail.webcreationuk.com/ or http://mail2.webcreationuk.com and use your email address and password to log in. For additional help with Thunderbird, please refer to the http://www.mozillamessaging.com/en-GB/thunderbird/ for more assistance from Mozilla. If your Internet Service Provider is requesting you to use their outgoing mail server, please follow their instructions.